Every single person that I know of, has tried this..some love it...for some its just not their thing. 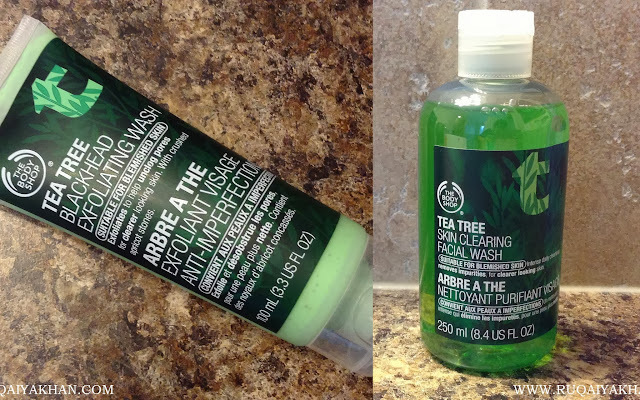 I have been observing people search for tea tree up on my blog, so thought about collecting all on my thoughts on the two Tea Tree products from The Body Shop, I am currently using, in this post. Before we begin, lets make one thing clear - Skincare is all about consistency and routine. To get results, I recommend hooking on to a skincare product for at least 6 weeks! You have got to finish up the whole bottle of whatever product you use to see results. Obviously, if its breaking you out or causing any other symptoms, then you must stop using it. Other than that, please understand that miracles do not happen overnight! So try using up the whole product or up to 6 weeks and see if there are any positive changes. Tea Tree range from The Body Shop is a best seller and I can certainly imagine why, as it works great for almost all skin types. It pretty much does what it says, if you use it consistently. Lets begin with photos and them we will move on to what it did to my skin. I have been using this face wash for the last 6 months and I repurchased the bottle twice. Its a 250 ml bottle, so its a lot of product in there. It promises to remove impurities for a clearer looking complexion when used daily. Its suitable for blemished skin. Over the months, I realized I did have fewer breakouts. Even when I did, mostly at that time of the month, they did clear up completely in a week. I usually break out around my jaw line and I am happy that this helps me. My complexion definitely looks much clearer and brighter. I am also using The Body Shop Vitamin C serum on a daily basis so it could be a combined effect. It surprisingly does not dry out my skin. I often use it with my Sigma Cleansing and Polishing Tool and it works amazingly well with that too. Its not soapy at all and that's just how I like my facial stuff to be. As I am in my late twenties, I felt my skin needed something more gentle than St. Ives Apricot scrub. I know the power of apricot stones for removing blackheads, whiteheads and flaky skin. This too, has those in a creamy tea tree paste. Unfortunately, the texture is so creamy that doesn't quite work well on skin, until I use double the amount of how much I would actually use for some other scrub. It definitely does give a deep cleanse to my skin. I also use this on some days with the Sigma Cleansing and Polishing Tool, on the lower speed of course. Blackheads on my nose, whiteheads on chin and flaky skin around the corners and tip of my nose, is now history. I really like how it treats my skin and I love the results. Overall, I like these two and I also liked the Tea Tree Foaming Facial Wash, I have used before. I think these products are amazing. They do not cause any reactions to my skin and helps in keeping complexion clearer. I use the Sigma Cleansing and Polishing Tool 3-4 times a week with these products and I also use the serum I mentioned above. The overall effect on my skin is great. I would recommend trying these out as the formula is gentle, yet effective. I <3 TBS. nicely reviewed and u take some stunning pics! Lovely review, Ruqaiya! <3 I'm an avid user of tea-tree oil on occasional breakouts. Would love to try exfoliating wash.
Btw, is the Sigma Cleansing Tool anything like Clarisonic? Yea.. It looks similar but sigma's is just for exfoliating skin. Clarisonic has a different motion and does more than just exfoliation.